While neem flowers are widely available in many Indian shops these days, I carry them in bulk from India. This is mainly because it is from our home and we collect in such a way that we can spend less time cleaning. Storing neem flower does not need any specific handling and they stay fresh for more than a year. This recipe being useful for both diabetic & post natal mother’s. Make sure to omit jaggery if it is for diabetic and Chili & tamarind if it is for post natal diet. The recipe stays good for 3 days in refrigerator though I have not tried beyond that. I would not suggest to keep this outside beyond a day as this contains water and less oil. I have added oil second time, this is optional. For post-natal, non – gestational diet, you may replace oil with ghee. Cooking in claypot tastes the best. You can check that in my video. If you are using claypot make sure to switch off the gas a bit earlier as the heat will be retained for long time and the neem flowers would turn completely black. 1. Clean the neem flowers. Make sure its dry completely. 4. Add channa dhal, urad dhal, carom seeds & chili. Fry them for 2 minutes. Do not over fry them. 5. 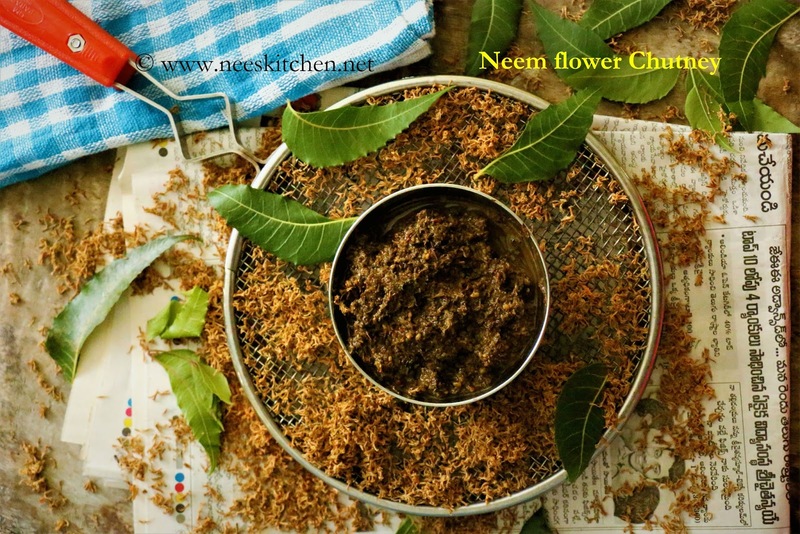 Add the neem flowers and add 1 tsp of oil and fry for a minute. 6. Add palm sugar, tamarind & salt. Mix them well. 8. 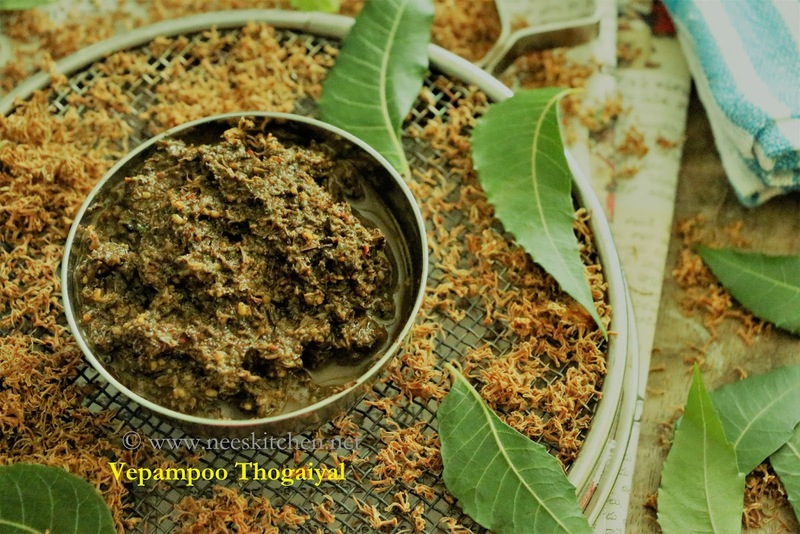 Fry until the neem flowers turn in to dark brown or black. 9. Allow this to cool completely. 10. Take a mixie and add water. 12. Serve with hot rice & ghee if it is a post-natal diet or server with broken wheat if it is for a diabetic meal. 1. For post natal diet, ignore chili & tamarind. 2. For diabetic diet, ignore palm sugar. 3. I have not made this too spicy as I wanted to make it kid friendly as well. Adjust the chili as per your taste buds.